UK MPs and peers from across the political spectrum are coming together to form an All Party Parliamentary Group to tackle illicit trade, with a focus on smuggled and counterfeit tobacco and alcohol. The cross-party group, which is being led by founder and Conservative MP Matthew Offord, will explore the issues and drivers of illicit trade, including supply and demand. Through a number of enquiries each year, the Illicit Trade APPG aims to produce recommendations for government, law enforcement, companies and consumers in a bid to crackdown on the activity. Offord, who has previously questioned the contraband impact of the new plain packaging laws for cigarettes and tobacco, said the APPG will push the illicit trade issue up the political agenda. "I've been out in my own constituency and seen first-hand the impact that counterfeit audio visual and smuggled tobacco is having. It takes away custom from legitimate businesses while putting those people who buy it at greater risk," he told BetterRetailing.com. In a statement, the Hendon MP said: "Illicit trade impacts everyone no matter what business they are in and no matter if they are a multinational corporation, a small high street shop, a consumer or a taxpayer. We also know that organised crime gangs are behind such seemingly low-level and innocuous activities." He added: "The group will act as an important vehicle in parliament to shine a light on some of the more [pressing] issues including whether the current approaches employed by government and law enforcement are up to the job." In response to the establishment of the APPG, Paul Baxter, chief executive of the National Federation of Retail Newsagents, said in a statement: "The businesses of legitimate independent retailers – some of which have been built up over many years – are being devastated by illegal tobacco and alcohol sales, harming the local communities they serve at the same time. The NFRN is pleased that a new cross-party group has been set up to tackle the illicit trade as we are fully supportive of any efforts that will raise the profile of the dangers associated with illicit products and deter the public from buying from the black market." In a statement, a spokesperson for Imperial Tobacco said: "We look forward to engaging with the APPG if called upon to do so. As a company we invest significant resources combatting illegal tobacco through our dedicated anti-illicit trade team and a national 'Suspect it? Report it!' campaign." 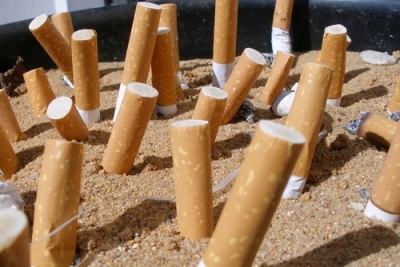 The market for smuggled and counterfeit tobacco costs the UK around £2.1bn a year. According to a report in July by the Royal United Services Institute think tank, one in seven cigarettes smoked in the UK (about 5.5 billion cigarettes) is fake or smuggled. The UK is the EU's third highest consumer of counterfeit and contraband cigarettes and tobacco after France and Poland. Most of the illicit trade – seen as "low-risk, high-reward" – is channelled through organised crime groups, which take the profits from the fake fags to fund other forms of crime. Most of the supplies are sourced from Poland, Belarus, Pakistan and Romania, according to the report, and are delivered to the UK in small parcels via post or courier services, which go under the customs radar. The report also argues that enforcement and penalties are too lax for those involved in the illicit trade. This was also a conclusion at a parliamentary event last month – hosted by cigarette manufacturer Japan Tobacco International (JTI), DUP MP Ian Paisley, Labour MP Stephen Hepburn and Conservative MP David Morris – where Paisley accused authorities of "turning a blind eye" to the illicit trade. "The tobacco industry has been so demonised over the years that it is almost impossible to have a sensible debate about the impact of this crime. Criminals are using this to their advantage," he said. "If we don't fight illicit trading at this level, we might as well give up at every other level. I encourage the Government to listen and recognise they have a job to do." In Ireland, similar calls are being made. Retailers Against Smuggling, which represents 3,000 small and medium-sized retailers, have urged the Irish government to crackdown on cigarette smuggling by increasing penalties and removing smuggling incentives such as increased excise taxes. With the border between Ireland and Northern Ireland central to Brexit negotiations, the group has also called for more resources to tackle cross-border smuggling. Meanwhile, illicit alcohol is also a problem for the UK. Last year, a Europol investigation found 10,000 litres of adulterated alcohol in the country. The Illicit Trade APPG will be advised by PA Consulting Group, which has previously advised British American Tobacco on projects to counter the illicit trade. The first meeting of the Group will take place on 5 September, with a work programme agreed at later meetings.